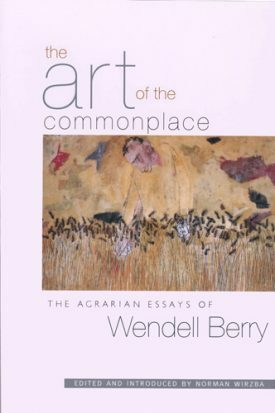 Collected here for the first time, the essential essays from Wendell Berry’s writings on agrarianism, agriculture, and community. Together these twenty-one essays offer an agrarian alternative to our dominant urban culture. Grouped around five themes—geobiography, an agrarian critique of culture, agrarian fundamentals, agrarian economics, and agrarian religion—they provide an excellent introduction to the wide range of Wendell Berry’s work. They also demonstrate that Berry’s writing promotes a clearly defined agrarian vision compelling to those dissatisfied with the stress, anxiety, ill health, and destructiveness of media-driven culture. Readers will find in these essays illuminating discussions on questions such as: Why is agriculture becoming culturally irrelevant, and at what cost? What are the forces of social disintegration, and how might they be reversed? How might men and women live together in ways that are to the benefit of both? And how does the corporate takeover of social institutions and economic practices contribute to the destruction of human and natural environments? Whether it be through his staunch support of local economies, his defense of farming communities, or his call for family integrity, Berry emerges as the champion of responsibilities and priorities that serve the health, vitality, and happiness of the whole community of creation. WENDELL BERRY is the author of more than fifty books of poetry, fiction, and essays. He was recently awarded the National Humanities Medal, the Cleanth Brooks Medal for Lifetime Achievement by the Fellowship of Southern Writers, and the Louis Bromfield Society Award. He lives and works in his native Kentucky with his wife, Tanya Berry, and their children and grandchildren. NORMAN WIRZBA is an associate professor of philosophy at Georgetown College in Georgetown, Kentucky. The recipient of several awards and grants, his work has appeared in numerous magazines and journals. He is the author of The Paradise of God: Renewing Religion in an Ecological Age (Oxford University Press) and editor of The Essential Agrarian Reader: The Future of Culture, Community, and the Land (University Press of Kentucky). He lives in Kentucky with his wife and four young children.